but also the right to vote, to hold office and to be equal partners with men. claim to be one of the most profound social revolutions the world has seen. specific laws that penalize domestic violence and the United Nations Security Council now recognizes sexual violence as a deliberate tactic of war. realized. Almost two out of three illiterate adults are women. Girls are still less likely to be in school than boys. Every 90 seconds of every day, a woman dies in pregnancy or due to childbirth-related complications despite us having the knowledge and resources to make birth safe. something I have fought for my whole life. As a young mother and a pediatrician, I experienced the struggles of balancing family and career and saw how the absence of child care prevented women from paid employment. The opportunity to help remove these barriers was one of the reasons I went into politics. It is why I supported policies that extended health and childcare services to families and prioritized public spending for social protection. As Executive Director of UN Women, I want to use my journey and the collective knowledge and experience all around me to encourage progress towards true gender equality across the world. We will work, in close partnership, with men and women, leaders and citizens, civil society, the private sector and the whole UN system to assist countries to roll out policies, programs and budgets to achieve this worthy goal. I have seen myself what women, often in the toughest circumstances, can achieve for their families and societies if they are given the opportunity. empowerment of women. 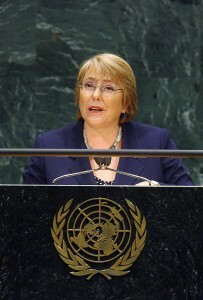 She is the former President of Chile.